The key to a successful family camping trip is to leave behind all your ‘other keys’. No really, take this statement literally. One of the most essential elements in a successful camping trip of any sort is the mindset that one is in. In order to get into the ‘camping’ mindset; leave behind all the tension that comes with carrying all your ‘other keys’; house keys, car keys, locker keys, drawer keys etc. When you enter the woods, be sure to leave your city life behind. Camping trips are easy to get right. Remember, camping is in our blood. Human beings have been camping for thousands and thousands of years now. First came camping, then came civilization. Remember. Right after you plan your camping trip, remember to go to a shop and purchase all of these items. Trust us, they are all equally important and are extremely useful in one situation or the other. The camping trail/area being shut for camping activities. No place to set up the tent as all slots have been reserved. Camping in an unsafe environment. Camping in the wrong season. On reaching, discovering a lack of camping activities. Just plan in advance and none of this should happen to you. Some camping trips are deemed to be unsuccessful on account of hunger. 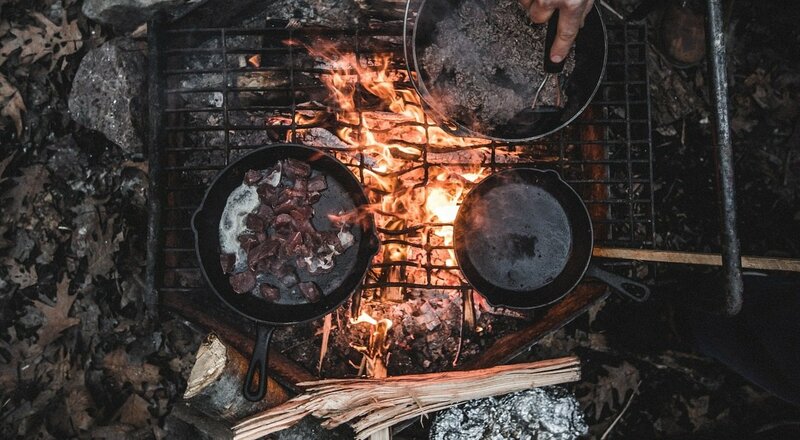 Food is very important to a successful camping trip.What’s more is that one of the charms that are associated with camping is preparing the food outdoors. Cooking together is an integral fun family camping activity. Therefore, keep your food scene always sorted out. Pack the right kind of food, do your research for that before. Always carry some dry food that doesn’t require any preparation like crackers, candies, chocolates etc. Water is also just as important as the food here. Not having enough water while camping can be a major source of frustration and trouble. A successful camping trip is a fun camping trip. The more real it feels, the more fun it is. Therefore, the idea is to get every member of the family a real feel for camping. An easy way to do that is by assigning every member with certain ‘camping responsibilities’. For example,you and your partner can be in charge of cooking, your kids can be in charge of collecting firewood and setting the tent up. Really, most of the unsuccessful camping trip stories begin with the onset of rain. The weather is unpredictable and therefore, irrespective of how planned one gets, rain is always possible. Place a tarp under your tent. Ensure that the seam of your tent is completely sealed up. If not, seal it properly with seam sealer. If your sleeping bags aren’t waterproof, to protect them from condensation, keep the bags in the center of the tent at night time. Some tents come with a rain fly up. If you have such a tent, any signs of rain, just put that up out there. Hopefully,this article has cleared up a lot of your camping doubts. Take a note of these tips and your next family camping trip will be a successful one, Cheers! Yogi and Suchna believe in taking the road less travelled and stumbling upon some hidden gems along the way! For over a decade, they’ve mapped their way across various continents, sniffed out unusual routes, discovered new flavours and stayed at quirky hostels. TheVillaEscape is their expression of soul travel. To check Iceland Trip From India you can catch up with them at TheVillaEscape.